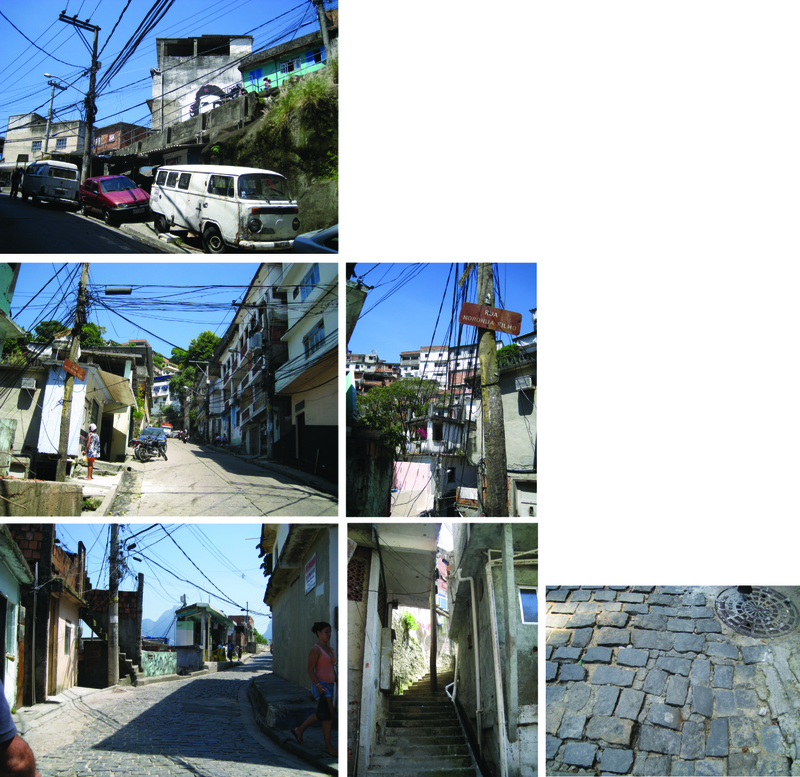 Part of the Favela-Bairro, Vidigal’s intervention was designed by Argentinian architect Jorge Mario Jauregui. Jauregui is one of the most important and well-known architects and important doing projects for the Favela Bairro and currently continuing some work in Complexos Manguinhos and Alemao as part of the PAC. 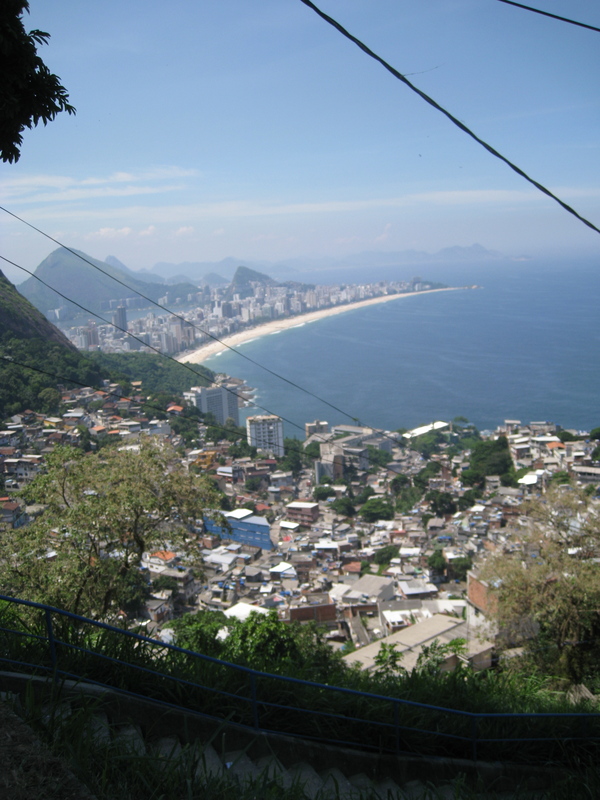 Vidigal Favela, with close to 200 000 inhabitants, sits on the hills in front of the beautiful beaches of Leblon and Ipanema. Needless to say, Vidigal has some of the most amazing views in Rio. Jauregui’s main design is structured around a curving, linear core, trying to take full advantage of the local landscaping potential. 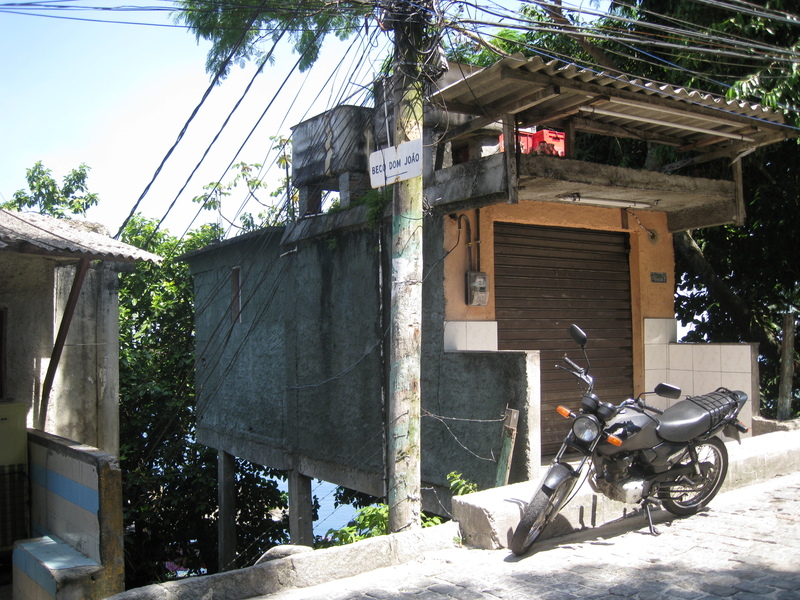 It begins at the entrance of the Favela, with a small plaza and amphitheater adjoining the Avenida Niemeyer, and ends at an upper outlook (also the top of a proposed, yet never constructed, passenger cable-lift). A series of functional elements was configured for installation along a one-kilometer stretch, constituting community foci of varying strength and character. In addition to a sports center, soccer field, communal laundry amongst others, a public square was also introduced. According to Jauregui, the form and colors applied (mostly purples and greens) distinguish his interventions as “progressive landmarks for a better future”, while relating to culture and context. As such, the architectural form and colors aim to create visual symbol for the periphery, giving it prominence while generating a sense of pride and belonging for the residents of Vidigal. 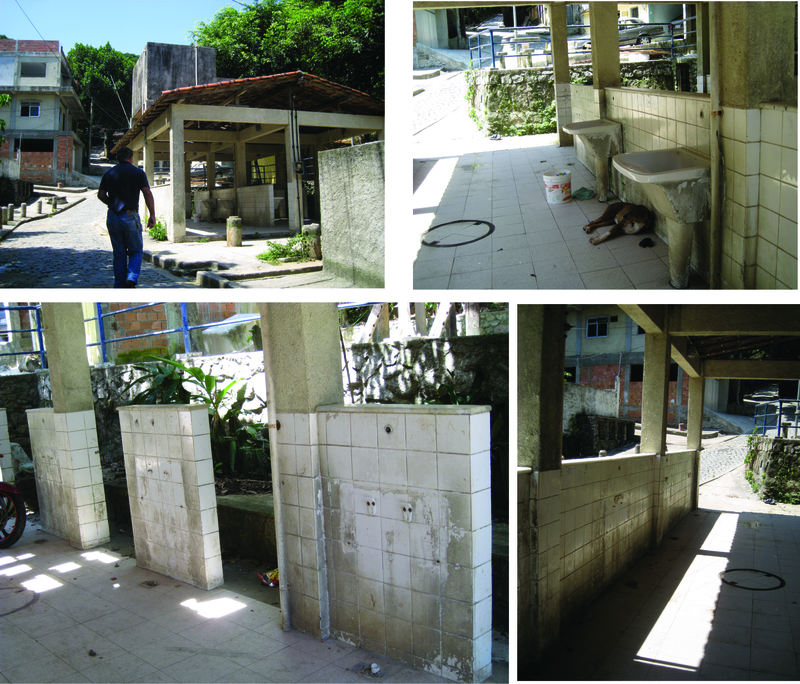 The reality that I was able to observe while visiting the favela is a little different. To begin, there seems to be quite some issues with the maintenance of the projects (the concrete is breaking and chipping in places, fences are torn, equipment is vandalized…). Part of the problem is that the major public spaces (Olympic village, soccer fields and parks) have been completely appropriated by the local drug dealers. 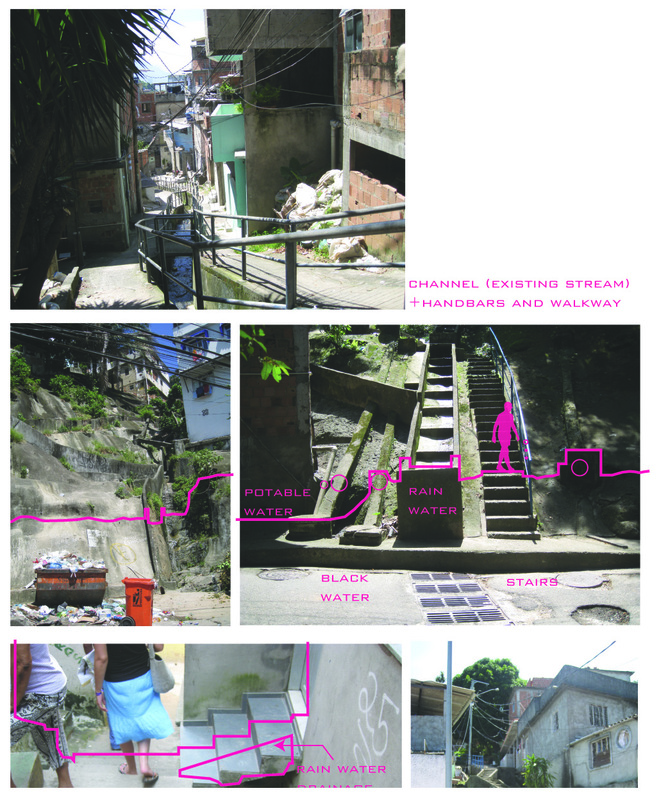 In this regard, since most of the interventions are located on the top and edge of the informal fabric, they seem to have remained physically disconnected from the rest of the favela, and did not allow the necessary visibility or appropriation (Jane Jacob’s “eyes on the street”) by the surrounding community. Even if Vidigal’s intervention didn’t achieve the best results, I want to stress out the importance of representation and image in these types of intervention. Since many of these shantytowns, barrios, slums, and informal sectors are not acknowledged nor registered within the urban network, the establishment of a new identity is extremely relevant, thereby turning the image and the specific design of every intervention into major components. In this sense, the architectural form and language, the treatment of the surface, etc. are used to give more meaning to the project, and ultimately to boost a sense pride, of community and belonging. 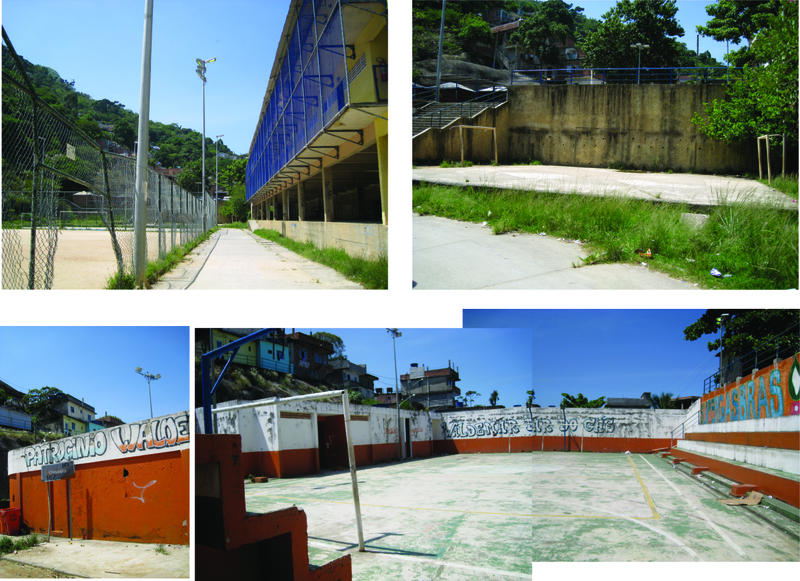 ← Parque Royal :: Favela Bairro’s Dimming Star?